MathRider » Blog » Is It OK To Spank A Misbehaving Child Once In A While? « Does More Recess Mean Better Students? Michelle Knox, like most mental health professionals, noted the irony that it is against the law to strike prisoners, criminals, or adults in the USA but it is perfectly legal to hit the most vulnerable people in society – CHILDREN. But aren’t there exceptions? Can’t a light tap to the backside do a misbehaving child some good, or at the very least, cause any significant harm? Parents think so, but specialists suggest otherwise, claiming that there’s no sufficient evidence to support that claim. In general, spanking often leads to teaching children aggression. Should we spank a misbehaving child? From a professional and personal standpoint, I do believe that it’s not okay to spank a child even when they are misbehaving. They are children after all. Though some parents that it’s a good way to change bad behavior, you can use a different approach by means of proper application of conditioning techniques as taught by Ivan Pavlov and BF Skinner. Corporal punishment may be something we received back when we were still young, but times are different now. 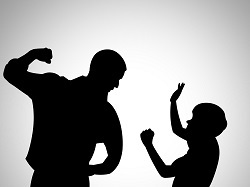 Children are more malleable and easier to mold, and thus, any mistake of introducing aggression into their lives could be detrimental to their development. This entry was posted on Thursday, February 25th, 2016 at 2:43 am	and is filed under Commentary, General. You can follow any responses to this entry through the RSS 2.0 feed. You can skip to the end and leave a response. Pinging is currently not allowed.